Like Beauty, the interpretation of scientific data is often in the eye of the beholder. I’m an engineer with more than a smattering of book-learning in the geologic sciences. It has always struck me as appalling that the scientists who would reorder our very lives around their interpretation of climate science and its implications for our future have so little interest in earth history and the geologic time scale. Climate scientists seem to focus on time on the order of a human lifespan, or the timescale of written history as the only time frame of interest. But in terms of the geologic time scale, human history is the blink of an eye compared the 4.5 billion year age of the earth. The end of the last ice age, a monumental, undeniably non-anthropogenic warming event, happened about 12,000 years ago; to a geologist it may as well have happened a week ago last Thursday. Yet climate scientists rarely address the implications of that warming event on their modern-day warming theories. But this week, a new study came out which alarmingly concludes that CO2-forced temperatures are at or near their Holocene (post ice age) maximum. One could look at the same data and wonder how cold we might be if not for Global Warming. Indeed, it shows the abrupt warming at the very end of the last ice age, followed by several thousand years of temperatures well above the 1950 baseline. For the last 5,000 years, though, the planet has been cooling, a trend that has even accelerated for the last 2,000 years. 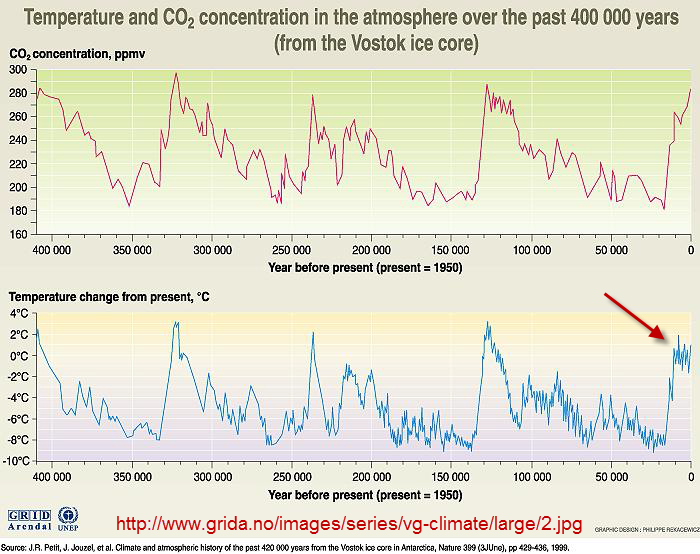 But for some real perspective, let’s look at some data from the Vostok Ice Core. It affords a look at the last 400,000 years of earth history, encompassing several ice ages. The warm periods are but brief interludes between ice ages. Wild temperature fluctuations were common before any possible impact of human civilizations. The anomaly is the stability of the moderate temperatures during the Holocene, the last 12,000 years (indicated by my red arrow), when warm weather fostered the development of human agriculture, cultures and civilization. Consider what a global ice age would mean. Cincinnati, OH and points north would be under a glacier hundreds of feet thick (not necessarily a bad thing, in the mind of some readers and SEC football fans). Agriculture would be impossible in North America. The planet could sustain a tiny fraction of its current population. Even with a cooling of a couple of degrees Celsius, crop yields and growing seasons would shift dramatically for the worse. It would be increasingly difficult to feed the planet. Given the choice between Global Warming and Global Cooling, give me Warming any day. This entry was posted in Climate and tagged AGW, Al Gore, Climate Change, Global Warming, Holocene Epoch, ManBearPig, New York Times, SEC Football. Bookmark the permalink. Really? How much life is there in Antartica, where it is cold? Not much. You agree with everything (a single premise, btw) John states, then proceed to call him uninformed and demand he never post here again? Enjoyed you’re commentary….funny thing is that I was making this same point to colleagues just last week…though from a much less informed viewpoint…you data from Vostok is intriguing and as this is public knowledge why is it not noted & discussed rather than ignored in the entire climate debate…? Note that my source for the Vostok graph is a Norwegian group that is collaborating with the “U.N. Environmental Programme” — definitely not a skeptic site! The ice core itself dates to 1998, so this is old news. Have you noticed that anything that casts doubt on the “consensus” view is routinely ignored while anything supportive gets banner headlines? True science is robust enough to stand a little good-faith skepticism. Climate Change theory is as fragile as a hot-house plant so its boosters must defend it vigorously against all attacks. If you were a climate scientist, wouldn’t you want to know what your vaunted climate models say the temperature “should” be, without all the man-made CO2? 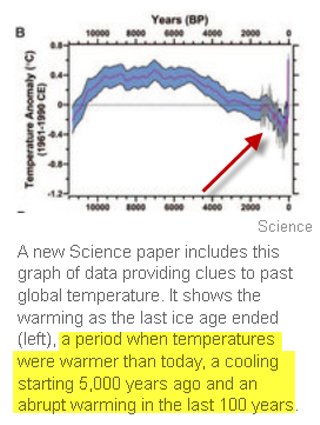 In other words, how much warming do they think has already happened? Enquiring minds want to know! What the hell do you know?! Vlad: does the Vostok core also record C14 isotopes (solar rad proxy)? And isn’t there a seperate study on sea floor sediments that looks at “marine snow” levels (sea water temp proxy)? Do you know if anyone has tried to combine all of these proxies to see what all of them say?